Normal level for all wines. In wines over 10 years of age, this level suggests excellent provenance. Rarely used, except to emphasize a particularly good fill level when other fill levels in the same lot are less than perfect. A common fill level at which many Châteaux release their wine. For wines of any age, this level suggests excellent provenance. Again, a common fill level at which many Châteaux release their wine. For wines of any age, this level suggests excellent provenance. Acceptable fill level for wines 8 or more years of age. Suggests proper storage conditions throughout its life. Natural occurrence for wines of this age. Usually not a problem for wines in excess of 20 years of age. This level may be caused by easing of the cork combined with natural evaporation. Check the clarity and the color of the wine in the bottle as a secondary indicator of provenance. Refer to High Shoulder and Mid-Shoulder level descriptions. 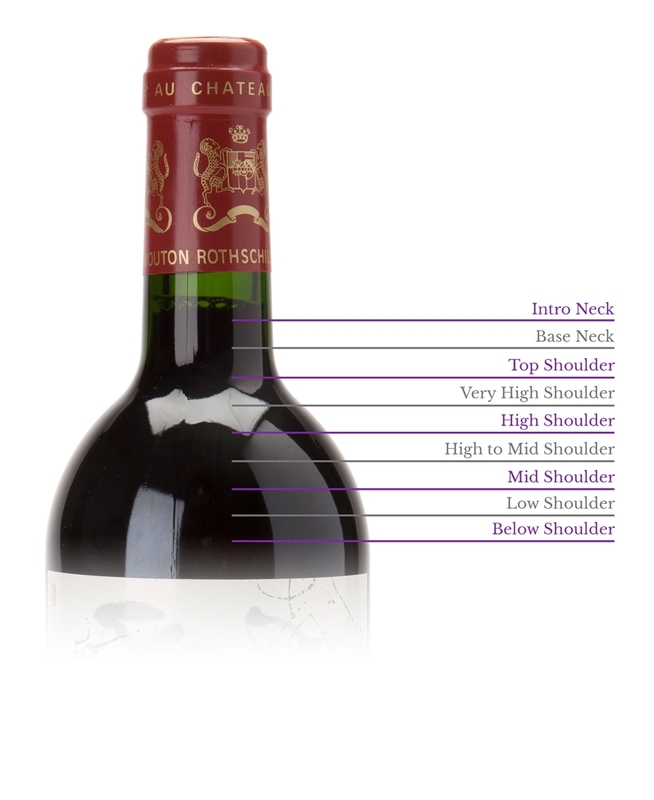 May suggest ullage during the life of the wine due to either easing of the cork or inconsistent storage conditions. Not abnormal for wines 30 or more years of age. As additional indicators of risk, definitely inspect clarity and color of the wine in the bottle, as well as condition of the cork. Suggests poor provenance. Definitely a risk and generally not sealable, with exception given to rare bottlings and/or labels. Not recommended for consumption. Wines are described in the catalogue as accurately as possible. Buyers are urged to make allowances for slight variations in ullages and conditions. No guarantee is made regarding provenance, and no returns will be accepted.